Premarkets: Ready for a comeback? Stocks: Ready for a comeback? It looks like the recent losing streak in stocks may finally be broken Thursday. 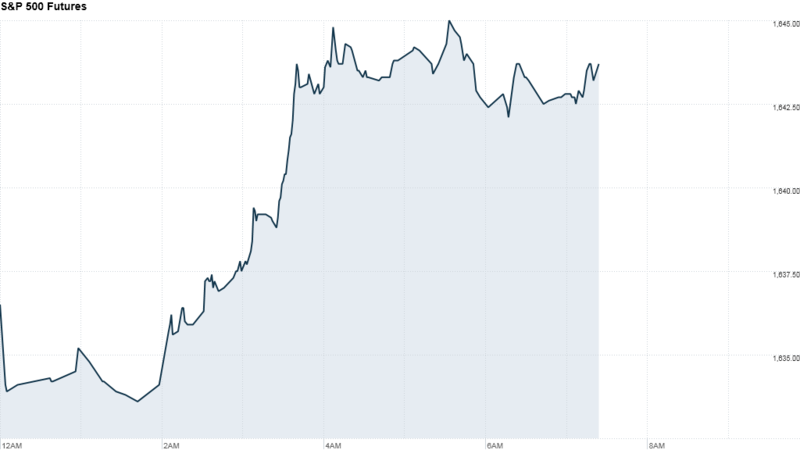 U.S. stock futures were all moving higher, up by roughly 0.3% to 0.6%. The markets have experienced a string of losses over the past few trading sessions. On Wednesday, the release of minutes from the latest U.S. Federal Reserve meeting pushed stocks lower. Investors have been in a bearish mood as they consider the possibility that the Fed will soon start pulling back on its massive bond-purchase program -- also known as quantitative easing -- which has propped up equity markets. Investors will continue looking Thursday for hints as to when exactly the Fed will start "tapering" its bond-buying program, as central bankers from across the globe gather for an economic symposium in Jackson Hole, Wyo. Ilya Spivak, a currency strategist at DailyFX, said the symposium is especially significant for investors since Janet Yellen -- a leading candidate for the top job at the Fed -- will be in attendance. "If Yellen is indeed chosen to take the reins next year, it will be up to her to manage the Fed's move toward monetary policy normalization. With that in mind, traders will be keen to hear what she has to say on the matter of QE 'tapering'," he said. Investors also await a weekly report on initial jobless claims from the Department of Labor, which is set to come out at 8:30 a.m. ET. In corporate news, Abercrombie & Fitch (ANF) shares plummeted in premarket trading after the clothing retailer reported slumps in quarterly sales and profits. Sears Holdings (SHLD) reported before the bell that its quarterly losses widened compared to a year ago, on falling revenue. Hewlett-Packard (HPQ) shares dropped after the company announced its latest earnings on Wednesday, showing that PC sales are still in the dumps. Dollar Tree (DLTR) will also report earnings before the bell, while Gap (GPS) and Pandora Media (P) release results after the market close. European markets were rising in morning trading, with many indexes rallying by more than 1% after a survey of purchasing managers indicated the region's fragile economic recovery may be gathering pace. Asian markets ended with mixed numbers. Stocks in Hong Kong popped up by 0.4%, while the Shanghai Composite index declined by 0.3%. This comes after the latest Chinese factory data pointed to a stabilizing economy. Indian markets also jumped higher after four consecutive trading days of steep losses. The Mumbai Sensex popped up by nearly 2%. Markets have fallen by 11% over the past month due to concerns about a flagging economy, political gridlock and an outflow of foreign investment money.